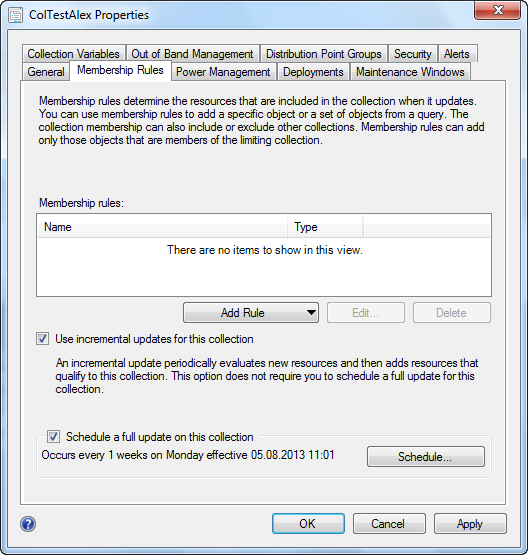 As described within the ConfigMgr 2012 Best Practices Wiki on TechNet it’s recommended to keep the number of collections with incremental updates enabled to around 200, this to prevent evaluation delays. So I thought it might be a good idea to keep an eye on collections with incremental updates enabled within our infrastructure using a PowerShell script. The property RefreshType within the SMS_Collection WMI class defines how Configuration Manager refreshes the collection. According to the documentation on MSDN the property can have the following 3 values. But while looking at the data returned by the PowerShell Cmdlet i noticed that there were also collections with a value of 6. As it turns out, when a collection has incremental updates enabled but no schedule the value is 4. But when both incremental updates and a schedule is enabled the value is 6. Therefore the list of possible values should be as following. The following script uses the ConfigMgr CmdLets Get-CMDeviceCollection and Get-CMUserCollection to retrieve Device and User Collections that have incremental updates enabled.